The color is mainly blue and black. 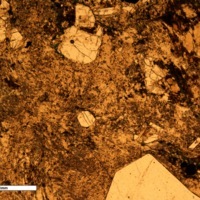 The sample is aphanitic and the cross section of the sample reveals very fined grained phenocrysts (~1mm in diameter). The colors of the phenocrysts range from white, blue, black, or green. It has rough sandy feel to it. There is some major chemical weathering. There is some white residue on the surface which has a minor reaction to Hydrochloric acid. -Streak = The dark spots on the sample had a dark-brownish to yellow streak, while the blue part of the sample did not have a streak. Oxidation is shown in the thin section. The matrix has blue swells. 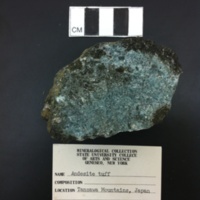 Some of the pyroxene crystals are very fine grained and show exhibit a "swirly" texture. The plagioclase crystals exhibit some crytsal-zoning. The sample is hypocrystalline. Others are fractured and filled in with very fine grained matrix. 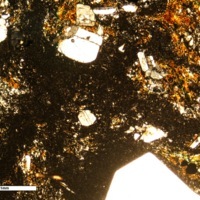 There are large fractures within the pyrozene crystals as well. Matrix is intergrown into coarse grained quartz. 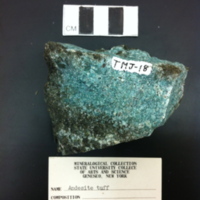 The blue mineral that is found through out the sample is made up of silicon, oxygen, carbon, calcium, sodium, and aluminum. 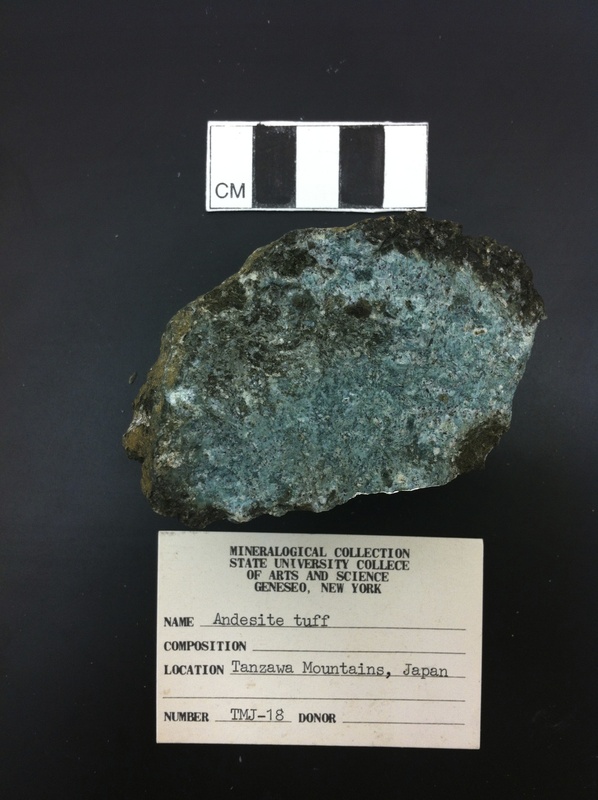 “Andesite Tuff,” Geneseo Geoscience Collections, accessed April 25, 2019, http://www.geosciencecollections.milne-library.org/items/show/361.